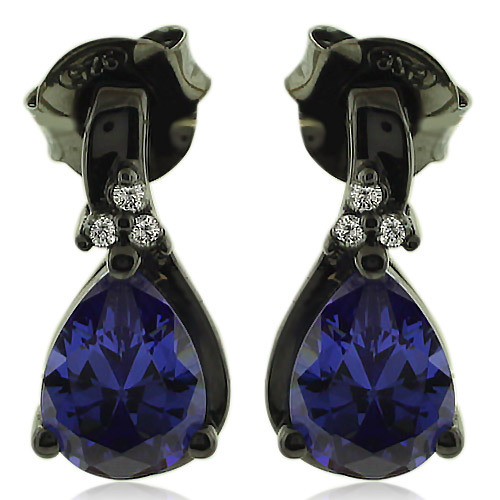 Drop Cut Tanzanite Earrings with Zirconia In Black Silver. Home/EARRINGS/Tanzanite/White Cubic Zirconia/Oxidized Silver/Drop Cut Tanzanite Earrings with Zirconia In Black Silver. Drop Cut Tanzanite Earrings with Zirconia In Black Silver. Fashionable earrings with zirconia and tanzanite gemstones (Approx. 7mm). The earrings are made with Oxidized silver of the best quality. The perfect piece for you.